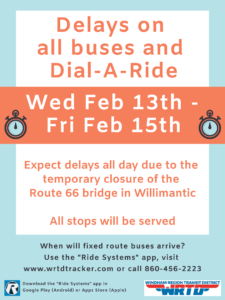 A temporary bridge closure in Willimantic will cause delays on all WRTD routes and Dial-A-Ride. 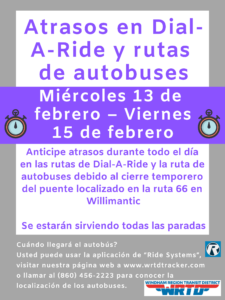 The detours will add time onto City Bus, Danielson, Route 32 and Dial-A-Ride. We anticipate traffic causing issues for other routes. Please plan ahead! Remember to use our GPS bus tracker to find out where the bus is! For more information about the bridge closure, click here .